Back in late November of 2007 I had just completed my first entry for the Cell-ebrities contest, Give it Time. I'd thought about that film and concept since I first heard about the competition back in the summer, but with over a month left to do something else it didn't seem like such a bad idea to make another movie. Up until then it was really just a thought. What I liked about Give it Time was that it was something I was able to do completely solo. It was a nice simple idea, with an original twist, and I knew it was unlike the other entries I'd seen on the site. I was more than happy to stand by my original film, and believed, given the other videos I'd seen, that I had the potential to be selected for the final round. Still, there's something energizing about putting your work out there. Being in the heat of things, so to speak, had me checking the Cell-ebrities site on a regular basis and telling everyone to check out my entry. It was now mid-December, and late one evening I found myself searching through pages of music on a royalty free site. Out of nowhere really, I found myself listening to a track that just sparked an idea. Having the desire to make another project is one thing, but having a complete concept pop into your head doesn't usually happen so quickly. Maybe it's fitting, and definitely cheesy, that the instrumental track was called 'Eternal Hope'. I can see now, that had I not come across the piece of music that I did, the Gizmo Tree and a second submission probably would have never happened. That exact night of finding the song I began to write and record some narration. I wasn't completely committed to the idea yet, but I figured if I put a few pieces together I'd know. A few minutes turned into a few hours and I found myself with a rough script, and a decent mock-up of my audio and narration. I was excited, and as only an evening of creative efficiency will allow, I had completed enough prep work to convince myself that the idea was still worth completing in the morning. As was the case with both my Cell-ebrities films, the production came together quickly and was helped by a lot of in-the-moment ambition. It was a Sunday that my friend Tyler helped me out in shooting what would become the initial scenes of my film. The weather was perfect for it, fresh snow on the ground, frost on the trees, all around a perfect winter scene. That night I remember being so upset because all of the dialogue scenes (with me in front, facing the tree) were off balance, and the shots just didn't look as good as the stuff shot earlier. Time was running out by this point. I was heading home for Christmas in less than a week, and I still needed to re-shoot, edit and then be sure I could upload to the site. A few months earlier in the contest, the site was down for nearly 3 weeks so I'd be lying if I said that I wasn't a bit superstitious or concerned that my luck would run out as I was rushing to finish. I went out the next day alone to re-shoot my dialogue scenes. There is a huge park around the Legislative Building in Regina, SK so that served as the location for my enchanted forest. There were about 3 or 4 different trees that I used as the actual Gizmo Tree throughout the process, but the biggest issue at that point was that the lighting for my re-shoot day had completely changed. The day before it was grey and snowy, the next day the skies were clear and the sun was shining. Although I wasn't initially crazy about it, as soon as I started shooting I could see how good it looked. The lighting created strong contrast, it added welcome colour, it made the tree really stand out, and it gave me a great silhouette and sunset to cut away to. 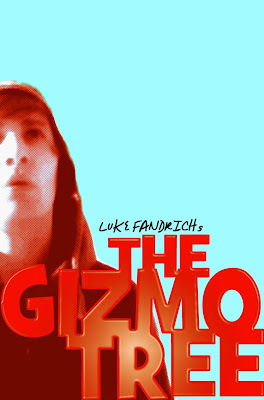 You can also see a few of the props that were used that day, including the Jumbo Diamond and the Gizmo Toque. I can't look at either of these items without associating the project with them. 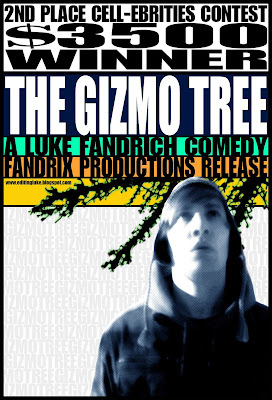 The Gizmo Tree was above all, another personal exercise in what I was capable of. I often work solo, not because I don't want to collaborate, but because at this point in my life I'm testing myself to see how I can work things out. There's just so much to learn, and if I can compete in a competition where groups of people worked on a film, compared to just me working on a film then I think that says a lot about my personal skill. It could also just be Charlie Chaplin syndrome kicking in and feeling like it's just better if I can control everything about my movies . . . and a lot times that's probably true. On January 9 the news came in the form of a voicemail message. "Luke, I have some good news. 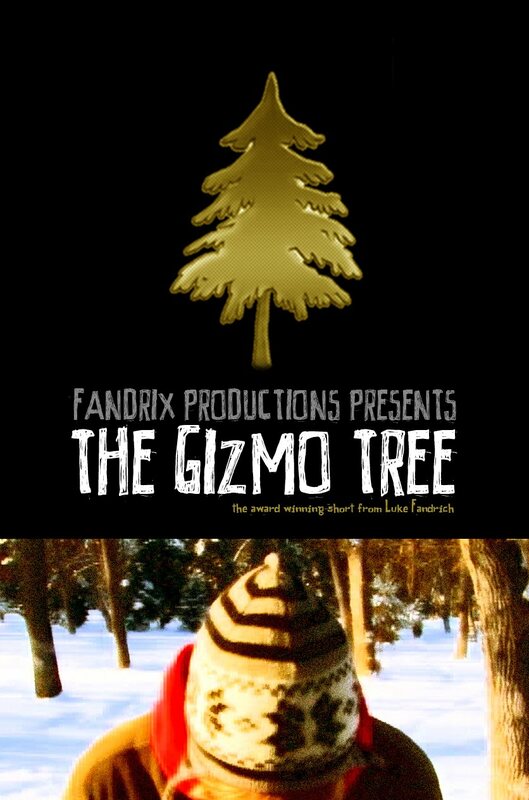 Not only did we love your film Give it Time, but we also loved the Gizmo Tree. It looks like both films have a great shot at being in the finals". Two days later, both films were indeed in the finals, and I was the only filmmaker in the competition to have 2 films in the Top 10. I never expected that they'd include both of my entries, I figured I had 2 diverse films and that I had a great shot at getting one of them selected. It was a pleasant surprise. Fast forward to late January 2008 and after a week of voting, promos, a new facebook group, and more emails and updates than I can really remember, the news came. I'd won 2nd place, $3500, and an amazing new credit to my name. 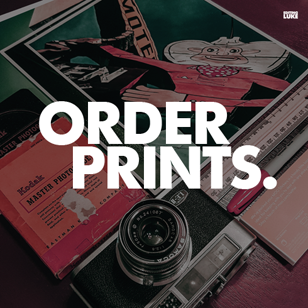 The several months of the process suddenly flooded forward and all the work and planning seemed like the completion of an intricate puzzle that I hadn't realized I'd made correctly until that moment. I just remember feeling so relieved that I finally had some money to pay the university, some money for myself, and from what it felt like at the time, finally some good news to share. At first there was rush of realizing what $3500 meant with me being a broke student. All that wears off pretty quick though. What stuck with me soon after, and what I still feel was the most enlightening part of the experience, was the overwhelming show of support and positive feedback that I realized I'd been riding on. When your pushing your work as hard as you possibly can, there's nothing like someone willing to get behind you and push too. Sure, I got the word out in every way I could, but it was the actual votes that won the competition. It's a testament to the people who wanted to see me succeed and their efforts to help me get there. At the end of it all I was told I was the largest single cash winner in the competition as the first and third place films each had multiple filmmakers attached. I received a giant novelty cheque which hung on the wall of my dorm as a reminder until leaving university in April. With a handful of wins and a handful of losses, it's experiences like this that remind me what an exciting career path I'm on. You never know where your next life lesson will come from; for a moment playing in an enchanted forest didn't seem quite so ridiculous. *Update 2009* After entering this short in the Yobi.tv Film Contest in December 2008, I became a weekly winner and semi-finalist to compete in the Yobi Finals in April 2009. Gizmo went on to get voted through 5 rounds, making the top 10 - just a few votes shy of the last round. While the finish was somewhat anti-climactic after coming so close to a win, I was very proud to have beaten out over 20 other independent filmmakers for my spot. Plus, the Gizmo Tree was viewed nearly 50,000 times during the contest. You can see my promo video for the contest here. Lovely one luke.. lots of emotions ran in me as i watched it. First it was funny , then it was touching and then it was hilarious a great job well done I should say. The music was good with nice soft beats and the scenery lovely. Also kinda shows the mans will to find his goal. I also liked the expressions,and the narrations-it made the video very much interesting.